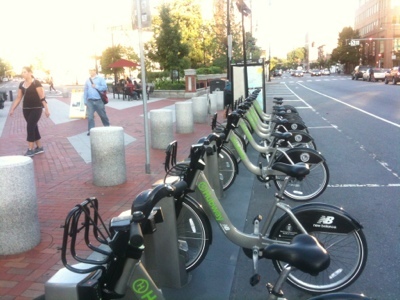 The Adventures of Sam and Caroline: Hubway comes to Cambridge! We are very excited that Hubway has finally come to Cambridge. This is the bike sharing rental service in Boston. We bought memberships last summer when it first opened, but it wasn't very useful for us because we couldn't drop off or pick up the bikes anywhere near our house. Now they opened three stations in Central Square, including one just a block from our house. It's a fun new addition to the neighborhood...sad that we will be leaving soon before we get to use it much.